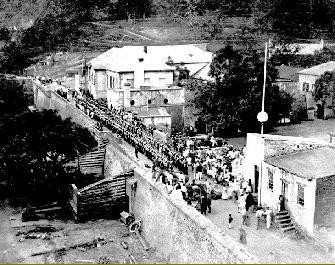 Above Left: The detachment of the 10th parade in St Helena, some time between 1865 and 1868. Below left: The 1st battalion's cricket team In South Africa in 1865. 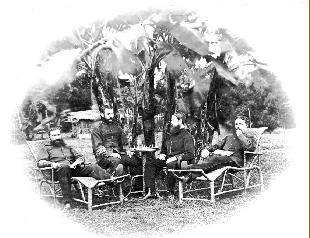 Right: NCOs relaxing in Singapore. After a spell of 8 years at home, the 2nd battalion were sent to Gibraltar in March 1881, but they didn't stay there long, for they were ordered to India, arriving there in January 1882. Nothing very remarkable happened during their stay there, apart from the fact that the assistant adjutant was shot dead by a private whilst drilling a parade. The private was executed. After ten years in India, the 2nd battalion went to Singapore and stayed there until they left for home in March 1895. It was now the practice for one battalion of a regiment to be abroad whilst the other was stationed at home, and so the 1st battalion left England for Malta in February 1895. Two months later, the ship bringing the 2nd battalion home called at Malta. For a brief few hours the two battalions met. There were speeches and a fair amount of alcohol was consumed in the officers' and sergeants' messes. battalions into one regiment, which now lost its number. Despite the Duke of Cambridge's opposition ("damned new-fangled methods") the two Regular battalions of the Tenth Foot became the 1st and 2nd battalions of the Lincolnshire Regiment. The North Lincolnshire Militia, with headquarters at the Old Barracks in Lincoln, became the 3rd battalion and the South Lincolnshire Militia, with headquarters at Grantham, became the 4th battalion. Meanwhile, a new barracks had been built in 1878 on the road to Burton in the outskirts of Lincoln, well away from the residential area of the city. Costing £48,000 and known simply as "The New Barracks", it was the depot of the Lincolnshire Regiment. The name was changed to "Sobraon Barracks" in 1953. 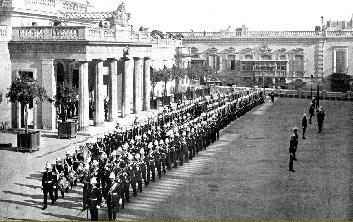 Above: The 1st battalion Trooping the Colour at Malta. Right:The New Barracks on Burton Road, Lincoln.